A 43-year-old Caucasian male presented with a two-year history of progressive right lower extremity radicular pain worsened by walking, lifting, and bending. The pain was distributed over multiple lumbar dermatomes, but predominantly the right anterior thigh and knee, and there was decreased sensation of the medial right foot. Lower extremity motor strength was normal. 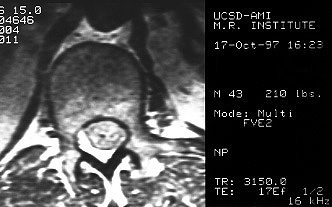 MRI of the spine revealed a discrete intradural, extramedullary, homogeneously enhancing, sausage-shaped mass extending from L1 to L2. 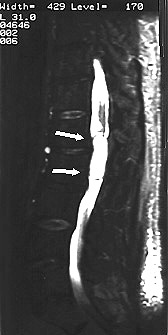 The mass occupied the left side of the thecal sac, displacing nerve roots to the right.